EUscreenXL gathered in Rome for our conference on the users and usage of audiovisual archives: “From Audience to User: Engaging with Audiovisual Heritage Online”. In this series of blog posts, we want to fill you in on what happened. 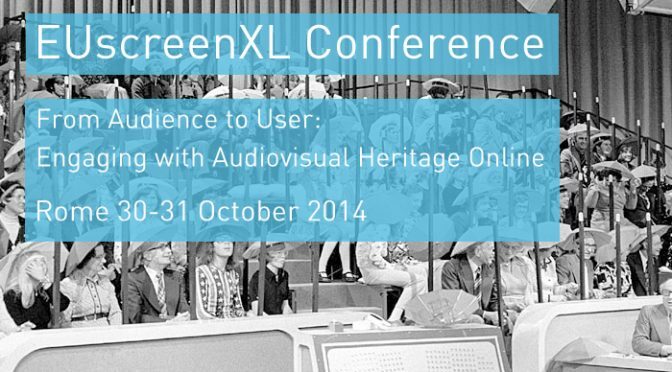 The presentations from the Conference are available on EUscreen SlideShare profile. For archivists, broadcasters, educators and anyone publishing content online, attracting audiences and engaging users with content is a key issue. Heritage projects and collection holders work hard at increasing the amount of available digital heritage content that users can engage with. This conference aims to lift the veil on knowing how and why users interact with digital resources. Having a better grasp on formulas for a functional web presence helps inform audiovisual archives what strategies work best to develop sustainable communities. Engaging users means inviting them to participate: in archival projects, in enriching collections and in disseminating their content. A user-oriented approach is crucial for both promoting online content and for developing sustainable futures for projects and institutions in the heritage sector. During the conference From Audience to User: Engaging with Audiovisual Heritage Online, the EUscreen network addressed the current challenges for online cultural heritage initiatives and discuss them with archivists, scholars of cultural – and particularly audiovisual – heritage, web designers, data specialists and policy makers. Day 2 of the conference was dedicated to interactive workshops on IPR and user experience as well as to meetings of the networks of academics dedicated to the AV sector.